Upload Speed ​​Enhanced UniFi Advance Plan. In accordance with the wishes and needs of the market , TM has increased upload speed of 30Mbps speed and UniFi Advance 50Mbps . According to the original specification , the upload speed (upload speed) for 30Mbps is 5Mbps UniFi package . But now upgraded to 10Mbps . For users UniFi 50Mbps , Upload speed is increased to 10Mbps to 20Mbps compared to before. For those of you who already have UniFi Advance Plan, you will enjoy this upgrade immediately. To those who do not get UniFi package Advance Plan, can register with us and enjoy unlimited internet with an attractive range of channels HyppTV low as RM6 a day . Need UniFi for home or your business? Why register with us ? TRUSTED : We are an authorized and registered agent for TM UniFi and Streamyx . SAVE : No need to TM Point , crammed in traffic , looking for parking and so on . EASY : Questions and registration is done by email / online . QUICK : Registration is fast 15-30minit after the personal details and documents obtained . Installation can be scheduled as early as 2-3 days . ALWAYS HAVE to answer your questions about the package , coverage and related questions . Experience more than 1 years in the registry and install UniFi and Streamyx . TRUE : We gave the correct answer , without exception , without any doubt . HELP : If you have problems port full / missing units / etc. we ‘re here to help . SAFE : Information and personal data safe without any violation of privacy . 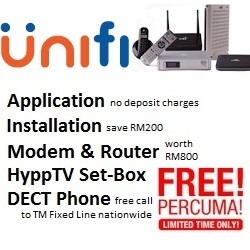 Please check coverage , see the package unifi , register online or contact us for more information . Unifi is not in your area? Let’s get Streamyx.